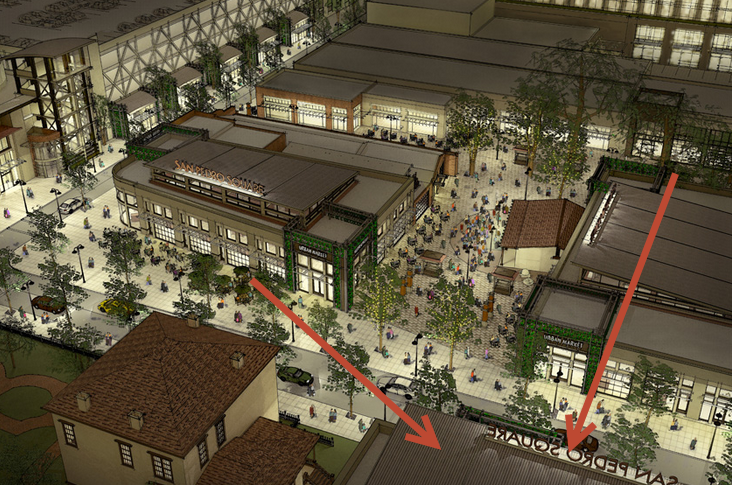 The San Jose Blog: San Pedro Square Market Planning Expansion! San Pedro Square Market Planning Expansion! Since launching in October 2011, the San Pedro Square Market has become a pivotal success that is changing perceptions of Downtown San Jose and serving as a catalyst for development. It is one of the biggest wins Downtown has ever had. Now, the SPSM is planning their first major expansion and has already acquired a 13,045 SQFT parcel across the street for this purpose. Today, this lot consists of a small house being used as an office for History San Jose and a surface parking lot. Eventually this will likely become a two-story building with retail on the ground floor residential or office on the top floor. The retail piece could easily be 40% of the square footage the Market has today and either support multiple vendors or larger, more traditional restaurants and shops. The icing on the cake is that they will incorporate some sort of public space next to the Fallen House, much like they did with the Peralta Adobe in the middle of the Market. My personal wishlist item for the expansion would be an underground Speakeasy bar similar to Singlebarrel. How cool would that be? Other retail will be coming as well. Centerra will have 8,000 SQFT on the ground floor of its tower right across the street from the Market and KT Properties is going to build two high-rise towers with the same amount of retail as exists today at the Market. This means within 4-5 years we may have triple the amount of restaurants and shops we have today in the San Pedro Square Market area. I can't wait to see how this shapes up! This is the best news I've heard in weeks. I love SPSM and want nothing more than its continued success and expansion. So what happened to Silvery Towers? When will they shut down the Wagon and expand into there? I heard the lease was not renewed specifically to expand the SPSM into there eventually.